New Amp: "the Ghost of Charlie Christian"
Who wouldn't like to have a time machine? I know one thing I would do would be to travel back to the dawn of the electric guitar, and listen in on a night session at Minton's Playhouse. There would be Charlie Christian, inventing bop and with it the tones and techniques that all electric guitarists use to this day. I can't help but wonder how it would sound live, instead of recorded on the primitive amateur equipment of the time. 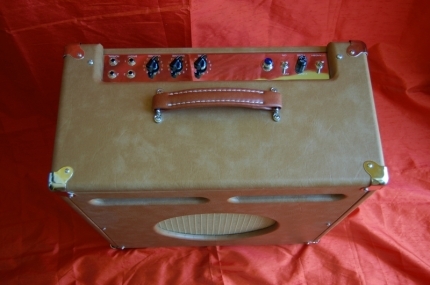 As promised, I'm going to start showing you some of the guitar amplifiers I've built. I've actually been tinkering with amps for as long as I have with guitars. My first attempt as an over-ambitious and under-informed teenager involved a cheap stereo console rescued from the neighbours' trash. It was a cheap power-transformerless design, and the experience of turning it into a guitar amp was so shocking (fortunately, only 120 volts... over and over and over) that I didn't dare touch one again for nearly 12 years. But then, if you build guitars for a living, what are you going to do for a hobby? Clic on the pic to go to my tube amplifier gallery. Just one amp there so far, more coming soon!